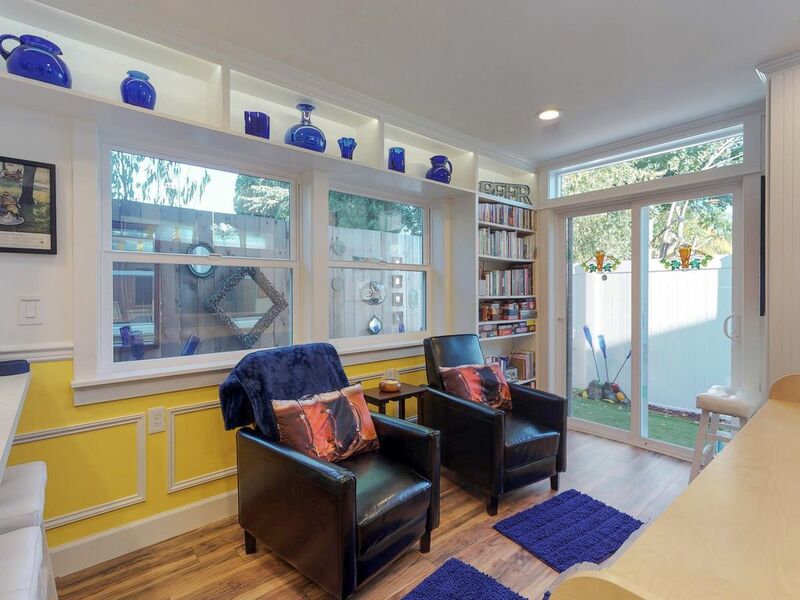 Later, grab your beer and relax in one of two cozy recliners in the bright cobalt blue and yellow living room. Plan your Portland adventure with a Portland or Pacific Northwest guidebook from the amply supplied bookcase. There’s a whole shelf of beer books to learn about beer styles or chart your course to any of Portland’s 105+ breweries. Use the flat screen TV on the desk as a monitor for your laptop with the included HDMI cable and stay in touch with friends using the free WiFi.. Parking Notes: Parking space for one vehicle only is located on the left side of the driveway (inside the white painted lines). I rented this cottage because of its location and didn’t even know there was a theme to it until I arrived. I am not a beer drinker; however, the way they have used the beer theme is absolutely incredible. They obviously have done a lot of research about how to maximize a small space and the way they personalized it around the beer theme is incredibly charming. The first hour we were here we spent our time searching through the house to discover the little touches that he demonstrated the thought and care that went into the creation of this cottage. The designers are to be congratulated for their thoughtful execution down to the smallest details. Something interesting to look at everywhere in this immaculate unit. Comfortable bed, thoughtfully appointed. Loved the location. Dedicated parking space was nice. Quiet neighborhood close to St John area. Close to downtown but away from the hustle and bustle. Owners helpful figuring out heating system. Loved it!